Boffa Miskell, in conjunction with Abley Transportation and Mike Cullen were appointed by Waimakariri District Council in mid-2010 to prepare an Issues and Concepts document as part of the development of a town centre strategy for Rangiora. This project began with a charrette-style design workshop over 4 days with retailers, landowners and key stakeholders. A public open day was also held. The outcome of the workshop was the identification of a series of ideas and options. These were explored in more detail by the consultant team in preparing a document for wider consultation. The Issues and Concepts document considers the future of the town centre over the next 10 years and beyond. It seeks to continue the town’s success and build on its strengths. 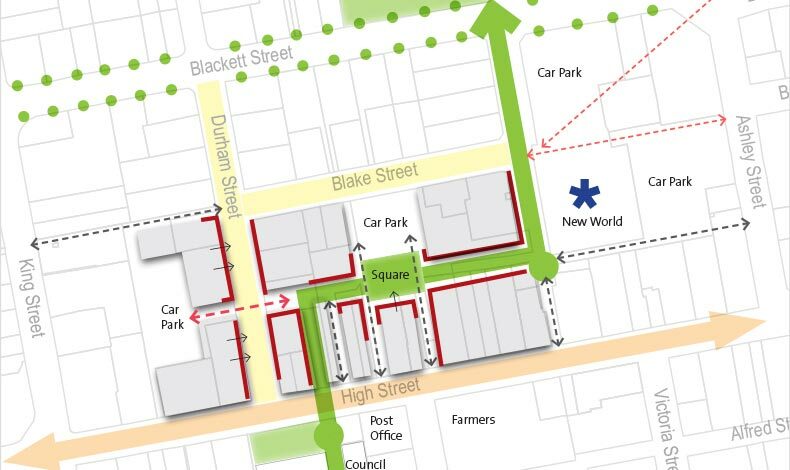 It focuses on different growth scenarios, improving access, including into the town and along the High Street, and enhancing the quality and character of the centre. The importance of accessibility to local retail and car parking was paramount. Wider public consultation was undertaken following preparation of the Issues and Concepts document. The document will guide future development in the town and be a reference for further studies and identification of a detailed action plan if necessary.